No one raindrop thinks it caused the flood. That saying is well-known and certainly applies to growing tennis at a community level as well. No one USTA member can be responsible for growing tennis, but throught the power of our numbers we can make a difference. 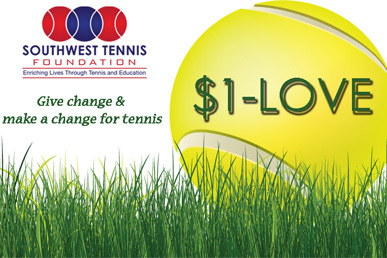 The Southwest Tennis Foundation has launched it's $1-Love Campaign to encourage our USTA Southwest members to collectively make an impact in helping us spread this great sport across our area by donating just a single dollar. That's it! 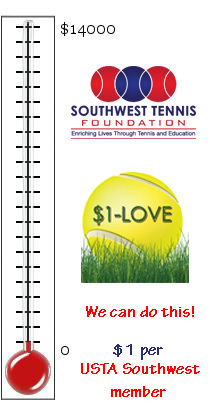 If we could raise $1 per USTA Southwest member, that would be almost $14,000. Give a little change and make a change...for tennis! Please, take the time today and donate. It's quick, easy and best of all cheap! You don't need a PayPal account to donate online, you can send as a guest...so no excuses. We cannot do this without your support!!! If this game has given you anything, this is a pain-free way to give back. The Southwest Tennis Foundation is the charitable arm of USTA Southwest, and gives out college scholarships to high school seniors for college, travel and financial assistance to talented young players to help them get to tournaments or better coaching. Just last year, one of our very own students - Enzo Vernon of Scottsdale received funding from the SWTF. Each year the Foundation strives to assist as many college students as possible. The Foundation also gives out grants to assist with creative tennis programming like the Arizona Special Olympics which has been held in Mesa the last few years or to other 'in-need' programs like wheelchair based tournaments. The Foundation also gives assistance for volunteer and official training. The scope of the Foundation is wide, and to do these things we really need the help of our generous tennis community here in Phoenix! Please consider donating! You can donate online or by mailing your contribution to the address listed below. For more information about the Southwest Tennis Foundation, visit www.southwest.usta.com/swtf. The Southwest Tennis Foundation is a non-profit organization under section 501(c)(3) of the Internal Revenue Service Code.